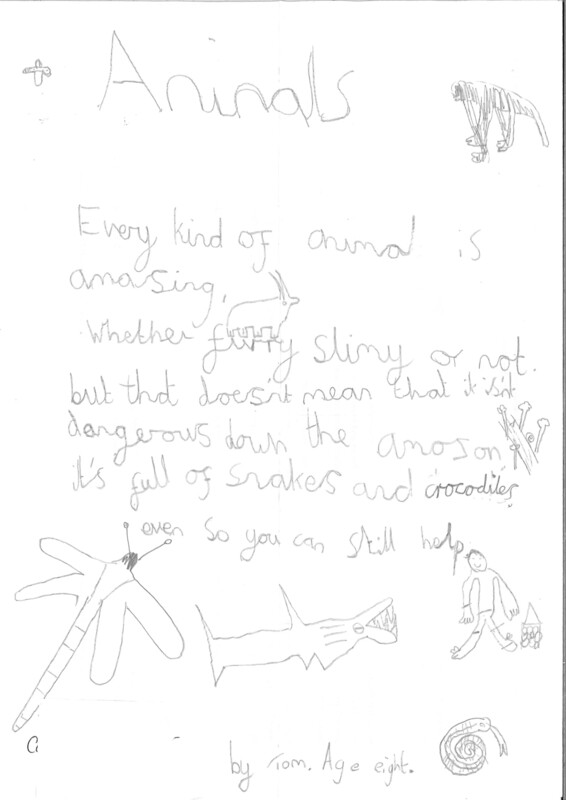 (If you've written a poem about wonderful wildlife you can send it in to us and it might get featured on this page or in the magazine). when leaves fall off the trees. it's when you can hear the buzzing bees. that this is the best time to rhyme. now I don't need to tell you twice. small red fox cubs slinking about. owl flying the forest throughout. are some of autumn's special fruit. there is an acorn that is cute. and autumn sweat, sweat smell. Please click on the picture to enlarge! And foxes hunt for some dinner. why we have 4 seasons. 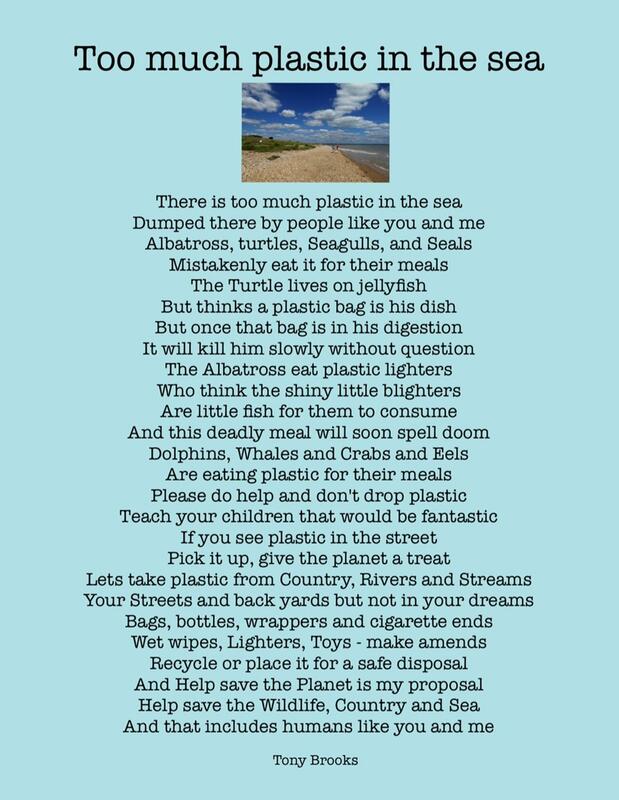 Tony raises awareness of the big plastic problem facing us all, through his beautiful poem. Click on the image to see a full-size version of the poem. Frogs and leaves, bristles in the tress. Cows and galloping horses, still bricks and walls. Flowers and birds are the beauty of the world! "The robin flew in the sky, The wind blew and way up high, a rainbow came, the sky bright blue, a light shone right down to you. All the colours shining bright, open your eyes to the light! The moon came out, the sky went dark, there's no more laughter in the park. The robin smiles and soundly sleeps, he won't wake up until alarm clock beeps. The park is silent, there's not a sound. As the robin sleeps on the mound." He slipped away to live another day. 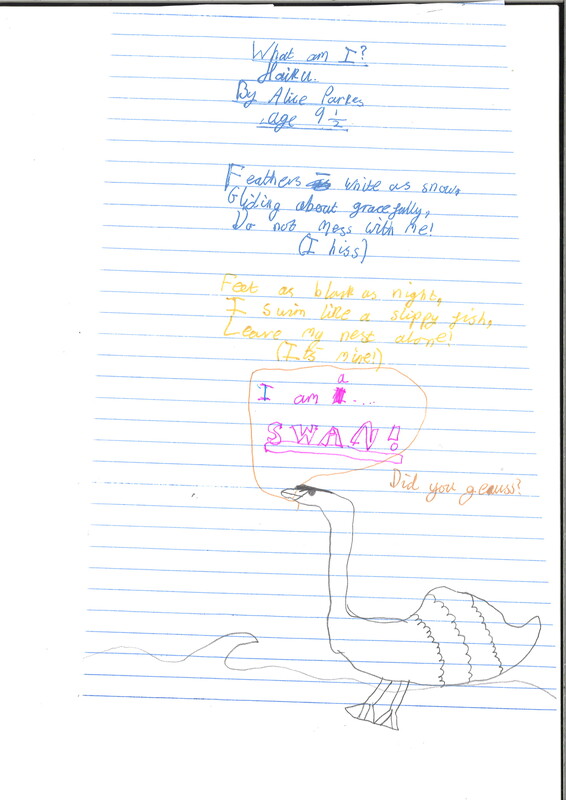 Swans as white as snow. Under the trees I see. Millions of rays from the sun. Minibeasts watching me from the sky. Running rivers to play in. Clouds flying by without a sound. Extreme sunlight is so nice. The Park a desert, nothing alive. No wildlife, just dogs scavenging about. No ozone layer, just hot sun on your face. Vultures pick bare bones, nothing left alive. And thought my vision was blurred through my tears. the greenhouse gases made their presence felt. We all drowned, every so and daughter. Out of Eden and far from salvation. Searching for quarry, perched on the wrist. The bird would be off with a powerful jolt. Her beautiful feathers fan out in sky. Is it an insect, bird, rodent or mammal? The bird has seen it from up in the air. While the bird up above, just flexes her claws. Above him those toes, as sharp as a knife. Where shall I kill it; what body feature? What he doesn't know is that he's about to die. Swoops down and kills it, with talons like steel. The bird in this poem is a harris hawk. Not quite as large as a Maribou stork!! Searching the ground with those evil eyes. He can’t find his food but carries on with his stunts. Until he spots prey, that he would call dinner. Catching live animals is not up their street. Above him, another kite’s having a peak. Silently gliding, not making a sound. She returns, frustrated, it’s the turn of her mate.